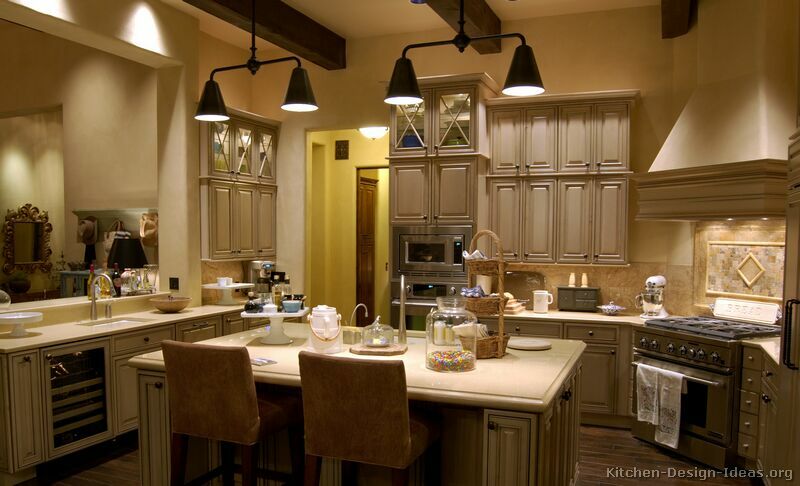 Gray Scale: High ceilings, wood beams, and tall staggered cabinets add scale to this luxury kitchen. Beautiful gray cupboards, a large kitchen island, a traditional wood hood, fancy glass doors, and dramatic lighting all combine to create a truly deluxe atmosphere in this magnificent kitchen. More Photos: Click here for more pictures of this incredible kitchen, which is first in the Traditional Gray Kitchens gallery. Updates: To get Kitchen of the Day updates, visit our Facebook page (here) and click "Like" to connect with us. You should follow us on Twitter here.